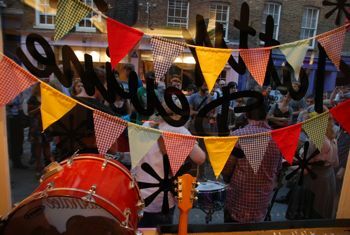 Were you at our Mini Instore Festival? 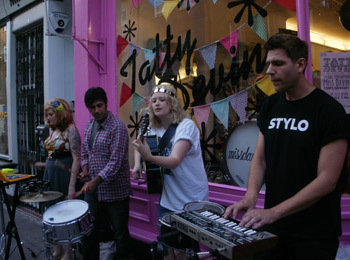 Last night the sun shone on us for our mini instore festival at our Covent Garden boutique. 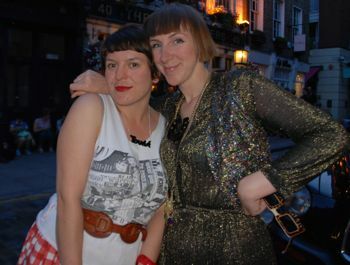 Ivania and Lisa, who run the shop, did an amazing job, and looked amazing! 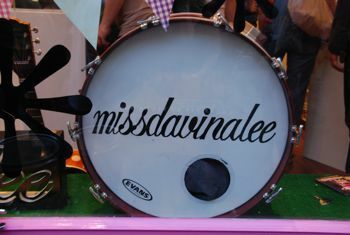 So many lovely people came down to see Miss Davina Lee play and to shop with 20% off! 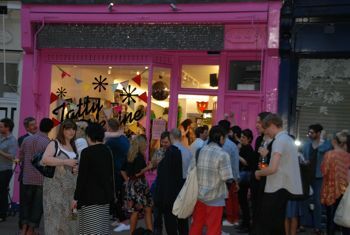 The shop made a glorious pink backdrop and the sparkly shop front twinkled for Miss Davina Lee's acoustic set. The band were great! Everyone walking by stopped to watch too and people in the crowd were given shakers. Everyone was shimmying along. 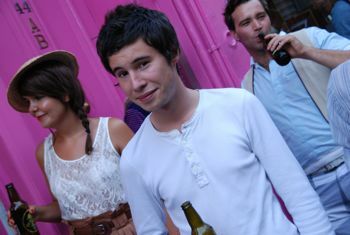 The festival mood was enhanced by the free flowing Kopparberg pear cider, which was delicious. 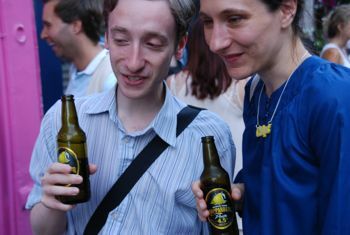 Here are Sonja, Charlie and our lovely French intern Franck enjoying it. Franck is very cool. 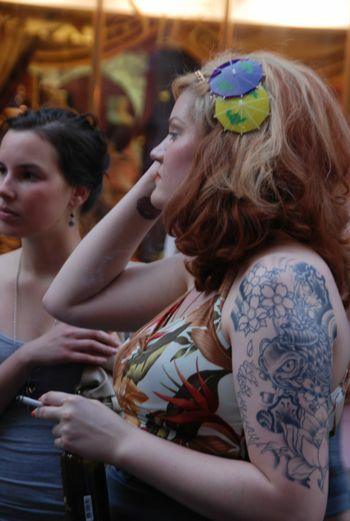 Here is the talented Jenny from Miss Davina Lee rocking some Tatty Devine Cocktail Umbrella Hair Barrettes. We love the way she doubled them up. Kirsty was super pleased her friend Giovanna popped down with her boyfriend Tom. Giovanna is an actress and a Positivity Guru - how cool is that. 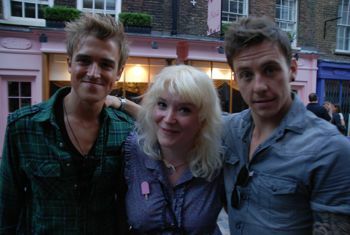 Here is Kirsty with Tom and Danny who are in a band called McFly which Kirsty likes. I am sure it was nice for them to be the ones watching rather then playing - maybe they will play at our shop one day? 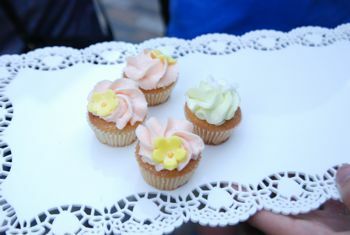 The lovely cakes from Ella's Bakehouse were so pretty and disappeared so fast it was hard to get a good shot of them - delicious! Thank you!!! 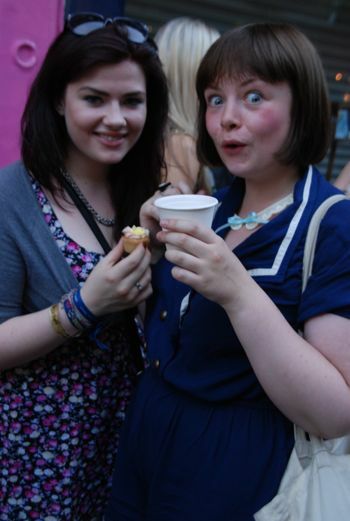 Here are Louise and her flatmate, who managed to get cupcakes! Louise (on the right) is going to be our new Saturday girl at the Brick Lane shop from this Saturday, so if you are going to be in the East End for Craftacular why not pop in and say hello! 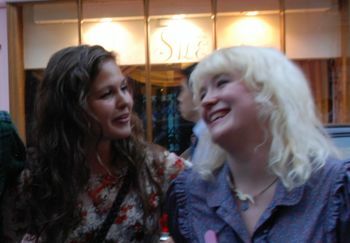 She is great and has been helping Amy and Kirsty with press and events. 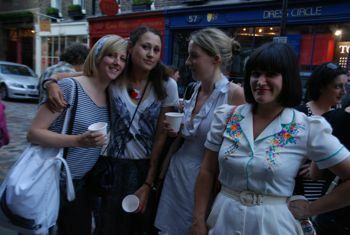 Here is Becky from events promoters Oh My God I Miss You with some friends. 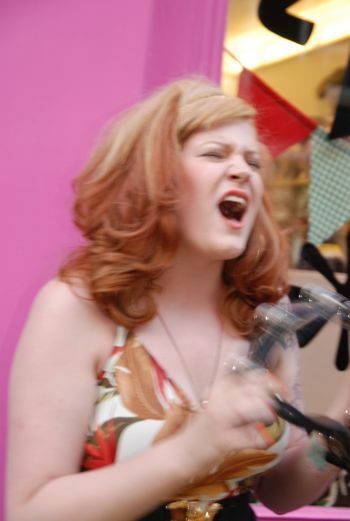 She is one of the models in our Best Of Tatty Devine collection. She models the Trapeze Necklace and the Moustache Necklace, along with Caroline and Stuart who she runs club nights with. 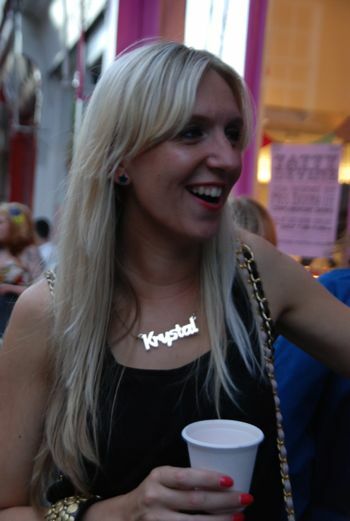 I spotted this name necklace in the crowd and just had to snap it, it looks great in gold mirror! 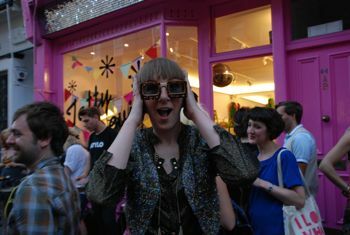 This is me in my Jeremy Scott TV sunglasses, definitely my favourite thing at the moment. When I saw these in Paris, I knew we had to stock them in the shop! If you look very closely you get a sneaky peek at some of next season's styles that are due to come out at the end of August!! The window display at the shop was looking really summery and Daisy was doing a great job inside dealing with everyone getting excited about shopping and trying things on. It was sooo hot in there yet Daisy manged to stay looking cool and summery. The Petal Necklace looks really pretty with her dress. Thanks to everyone for making it such a lovely evening . . and now on to getting ready for next week's summer party with Supermarket Sarah!